The trial of a man accused of fatally shooting an off-duty policeman in Akron last November got underway Monday morning in Summit County Common Pleas court. A 12-member jury visited the scene of the shooting—Papa Don's Pub—on East Market Street in Akron. 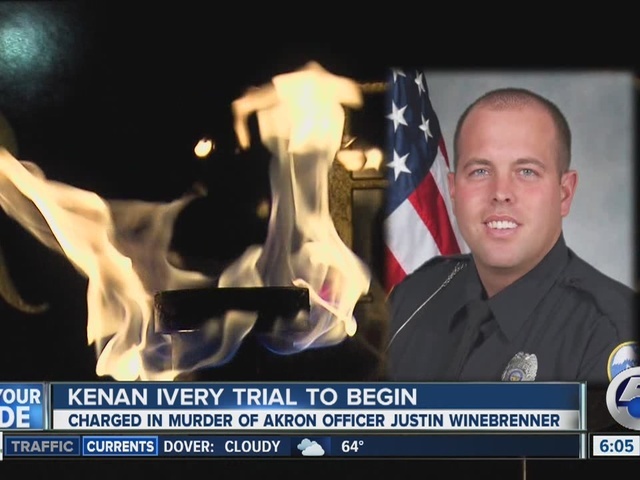 Authorities allege Kenan Ivery, 36, of Akron became unruly and was asked to leave the pub, then returned with a gun and shot Akron officer Justin Winebrenner . The 32-year-old Winebrenner was unarmed. Ivery pleaded not guilty on 18 counts, including aggravated murder. In court Monday, the prosecutor showed surveillance video from Papa Don's Pub at the time of the shooting. According to the prosecutor, Ivery was acting very strange the day of the shooting. The prosecutor said he was aggressively flirting with a woman at the bar just before the shooting. When Ivery asked the woman to sit next to him the woman said, "I have a boyfriend here at the bar." Ivery replied, "I don't care, I have a .40," referencing the gun he had with him, according to the prosecutor. Four other people in the pub were injured in the shooting. Akron Police Chief James Nice said Winebrenner and other people in the bar were heroes and may have saved lives by confronting the gunman. But the defense paints a different picture of the situation. The defense said this isn’t a case of "who-done-it," but a case of what exactly Ivery did. The jury must decide if Ivery committed aggravated murder, murder, manslaughter, or acted in self-defense. According to the defense, Ivery acted in self-defense. Ivery's legal team argues he forgot his food at Papa Don's and returned to retrieve, not because he wanted revenge. When he returned, Ivery was confronted by what the defense described as an intoxicated 400-pound man (David Wokaty) who threatened to hurt him. The defense also stated Ivery can be seen in surveillance video putting his hands up, as if saying, "he didn't want any problems," and didn't remove his gun until Winebrenner and another man put their hands on him. The trial is expected to last into October. newsnet5.com's Bob Jones is reporting and will have live updates during The Now Cleveland at 4 p.m. You can follow him on Facebook and Twitter .